Can we put a different application/user interface framework on the Android middleware? 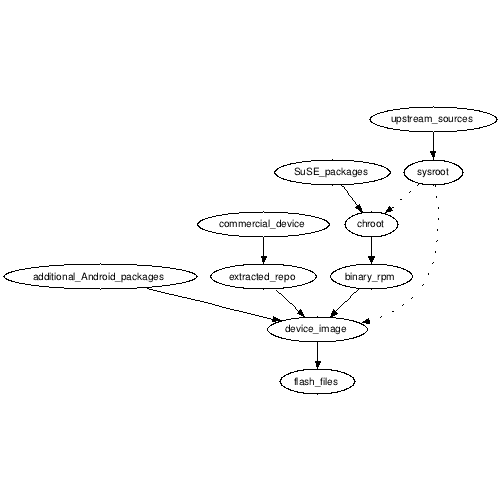 By cutting the Android s/w stack below the Dalvik layer, we enable other projects to experiment with non-Dalvik approaches to constructing user applications. Application frameworks, like the Android middleware, are so complex that it is easy to 'add' to them, but radically different approaches (like an HTML5-centric application ecosystem) are quite difficult to try. By carefully documenting/supporting the "below Dalvik" layer, it makes the 'testing of deliverables' from the hardware adaptation more precise and accurate. By allowing experimentation in different UI frameworks, it is hoped that teams will be able to make appliances running in far smaller devices than would be required if the entire Android application ecosystem was supported. Klaatu is a minimal linux system containing AOS kernel, HAL and low level daemons. With other AOS systems, several services depended on the Java engine (Dalvik). As the Klaatu system contains no Java engine, some additional services (daemons) are required to create a fully functional system.